Who says that fasting meals (vrat) are mundane, bland and unappealing? I wanted to serve Goddess Durga with a different curry this time. So made this phool-makhane ki sabzi with paneer. Once I had got the opportunity to taste this makhane ki sabzi in an Indian restaurant called “Sukoon”. Since then it was on my mind. But I finally tried it with home-made paneer on the 6th day of Navratri. Navratri is an Indian festival, in which we welcome Goddess Durga for nine days in our homes and offer her (naivedya/prasad) every day to seek her blessings. 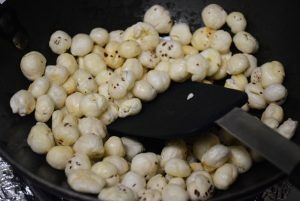 Makhane(Fox-nuts/lotus-seeds) are not only apt for fasts , but also nutritious for us. They are high in fiber and low in calories. You can use them for making namkeen (savory snack) or in a fudge like this – makhane ki burfi or in a sweet pudding (makhane ki kheer). This curry is usually prepared with peas , but since I had only frozen peas, I didn’t use them in fasts. 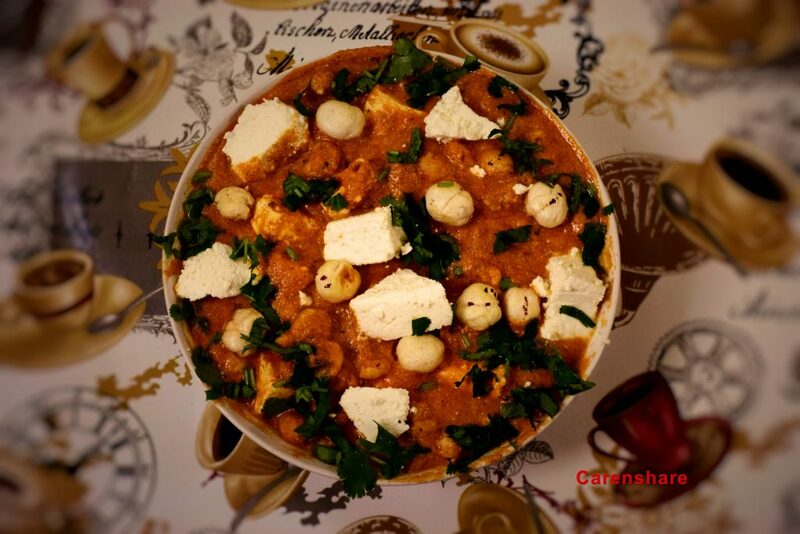 Paneer is used voluntarily, you may also use khoya (mawa) almost 1 cup(250 gms) in this recipe. Owing to fasts, I haven’t added garam masala (Indian hot spices blend) . Rather, I dry roasted the whole spices and then ground it . 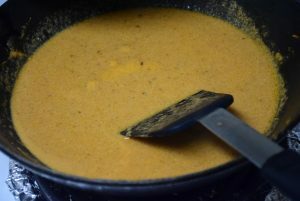 Since the store bought spice powders usually contains haldi (turmeric) which is prohibited in fasts. But this curry can be altered to suit your ingredients and circumstances. 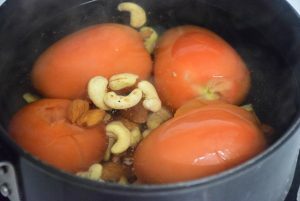 So lets begin the recipe now..
2.Once the water starts boiling, add the eye-removed tomatoes, cashews and almonds. You may also add ginger in it. But I forgot to add it. 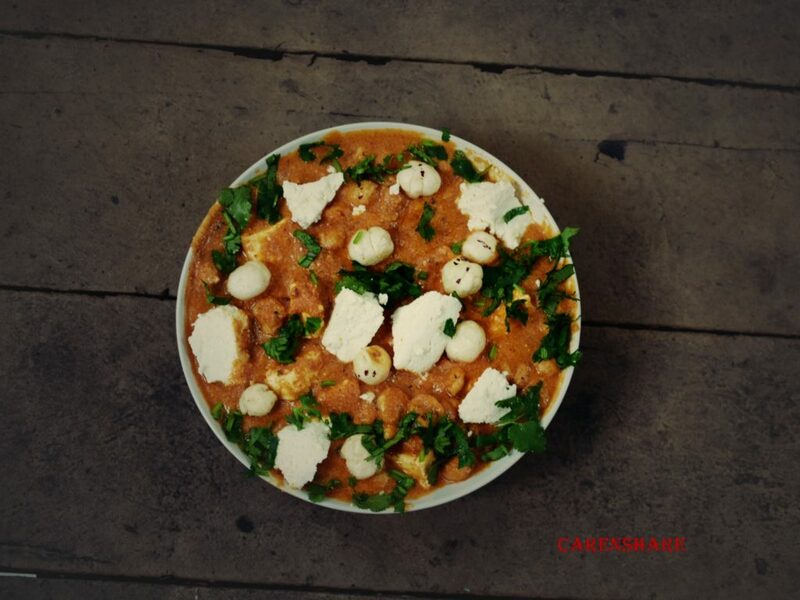 I don’t like the smell of garlic in paneer gravies , so I never add it. Also , in fast we skip onions and garlic. 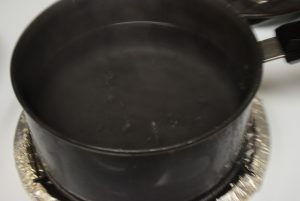 Let it boil for 2 mins. 3. Remove from heat and wash under cold tap water. Peel the skins of tomatoes and almonds. Let them cool to room temperature. 4. Heat a wok (kadhai) on high. Once it is hot, switch it to medium and add the whole spices viz. coriander seeds, cinnamom stick, black peppercorns, cloves, whole red pepper, black cardamom etc . and stir them till they are roasted. 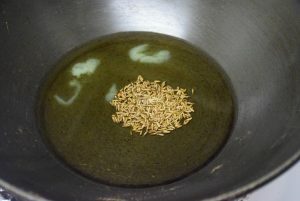 If you like poppy seeds (khuskhus) , you may add 2 tsp of it here and roast it with the spices. Alternatively, you may roast these spices in clarifid butter too. 5.In the same wok, add the fox-nuts and 1 tsp ghee . Roast them well till they slightly change color and emit aroma. You may dry roast them , if you don’t like ghee. 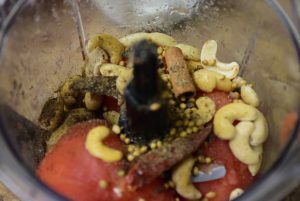 6.Now blend all the roasted spices with the boiled tomatoes – cashew-almonds in a blender /mixer. Paste should be smooth and even. 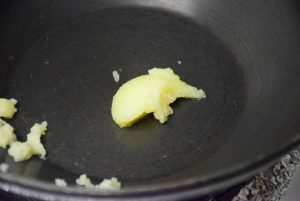 7.Heat desi ghee in the same wok . Once it is hot, add jeera to it. Let it sputter for few seconds. 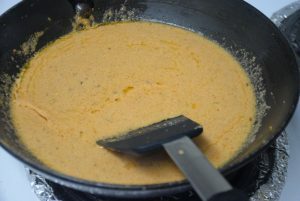 8.Then goes in the puree /paste just prepared. Stir it well and partially cover it to avoid splattering of gravy. Turn the heat to medium and keep stirring in between. 9. Add some water / milk to adjust the consistency. Also add salt, sugar to it and let it boil for 5 -8 mins. I didn’t add milk, since I wanted the color of the curry to remain intact. I also added little kashmiri red chilli powder to pop the gravy’s color. 10.Once it is well cooked, add the makhane and allow them to dunk in for 2 mins. Turn off the heat. Since they will absorb most of the moisture from the curry. 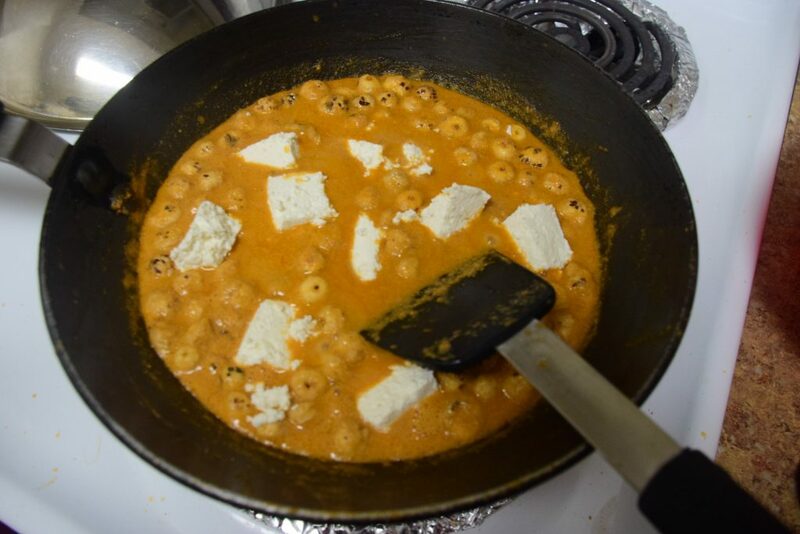 11.In the end add the paneer cubes and garnish with cilantro (dhaniya). Adjust the thickness of the curry according to your preference. I noticed that it is better to keep more water in the curry than needed ,since the fox-nuts are good succulents . I served it with Kuttu- paranthas. You can serve it with Roti, rice , naan etc . for your guests on regular days. I hope you find this recipe interesting and worth trying. Thank you for all the likes and comments in the past. It keeps me motivated !! Who says that fasting meals (vrat) are mundane, bland and unappealing? I wanted to serve Goddess Durga with a different curry this time. So made this phool-makhane ki sabzi with paneer. Once I had got the opportunity to taste this makhane ki sabzi in an Indian restaurant called "Sukoon". Since then it was on my mind. But I finally tried it with home-made paneer on the 6th day of Navratri. Navratri is an Indian festival, in which we welcome Goddess Durga for nine days in our homes and offer her (naivedya/prasad) every day to seek her blessings. Makhane(Fox-nuts/lotus-seeds) are not only apt for fasts , but also nutritious for us. They are high in fiber and low in calories. You can use them for making namkeen (savory snack) or in a fudge like this - makhane ki burfi or in a sweet pudding (makhane ki kheer). This curry is usually prepared with peas , but since I had only frozen peas, I didn't use them in fasts. 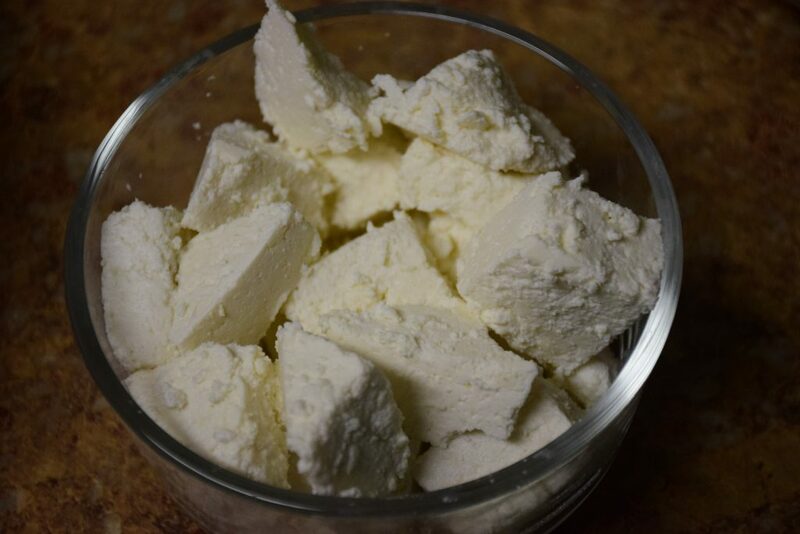 Paneer is used voluntarily, you may also use khoya (mawa) almost 1 cup(250 gms) in this recipe. Owing to fasts, I haven't added garam masala (Indian hot spices blend) . Rather, I dry roasted the whole spices and then ground it . 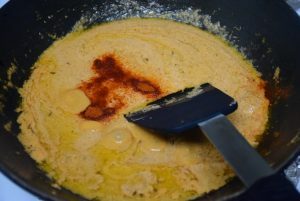 Since the store bought spice powders usually contains haldi (turmeric) which is prohibited in fasts. But this curry can be altered to suit your ingredients and circumstances. 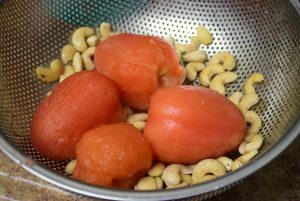 So lets begin the recipe now..
Once the water starts boiling, add the eye-removed tomatoes, cashews and almonds. You may also add ginger in it. But I forgot to add it. I don't like the smell of garlic in paneer gravies , so I never add it. Also , in fast we skip onions and garlic. Let it boil for 2 mins. Remove from heat and wash under cold tap water. Peel the skins of tomatoes and almonds. Let them cool to room temperature. Heat a wok (kadhai) on high. Once it is hot, switch it to medium and add the whole spices viz. 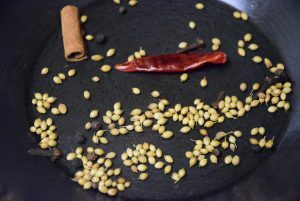 coriander seeds, cinnamom stick, black peppercorns, cloves, whole red pepper, black cardamom etc . and stir them till they are roasted. If you like poppy seeds (khuskhus) , you may add 2 tsp of it here and roast it with the spices. Alternatively, you may roast these spices in clarifid butter too. In the same wok, add the fox-nuts and 1 tsp ghee . Roast them well till they slightly change color and emit aroma. You may dry roast them , if you don't like ghee. 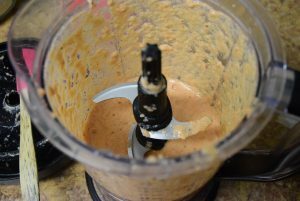 Now blend all the roasted spices with the boiled tomatoes - cashew-almonds in a blender /mixer. Paste should be smooth and even. Heat desi ghee in the same wok . Once it is hot, add jeera to it. Let it sputter for few seconds. Then goes in the puree /paste just prepared. Stir it well and partially cover it to avoid splattering of gravy. Turn the heat to medium and keep stirring in between. 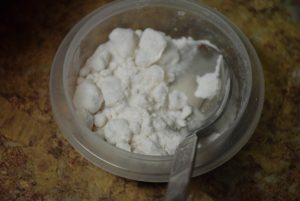 Add some water / milk to adjust the consistency. Also add salt, sugar to it and let it boil for 5 -8 mins. I didn't add milk, since I wanted the color of the curry to remain intact. I also added little kashmiri red chilli powder to pop the gravy's color. Once it is well cooked, add the makhane and allow them to dunk in for 2 mins. Turn off the heat. Since they will absorb most of the moisture from the curry. 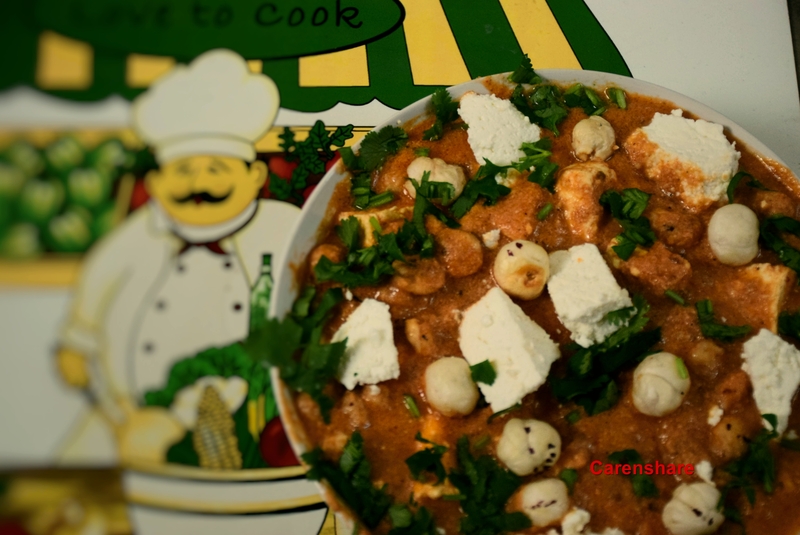 In the end add the paneer cubes and garnish with cilantro (dhaniya). Adjust the thickness of the curry according to your preference. I noticed that it is better to keep more water in the curry than needed ,since the fox-nuts are good succulents . 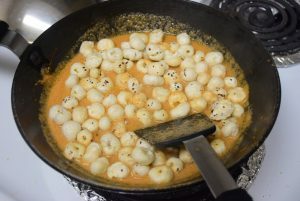 This entry was posted in Food, Recipes, Vrat Recipes and tagged carbs, Carenshare, deggi mirch, fasting, fasts, for fasts, fox-nuts, fresh ground whole spices, high in fiber, home-made, Indian cottage cheese, Indian garam masala, kahsmiri lal mirch, khoya, lotus seeds, magnesium, makhana, makhane, makhane ki burfi, matar, mawa, not Queso Fresco, paneer, potassium, proteins, rock salt, sendha namak, Shendhalu salt, shweta jindal, sindhaloo, vrat recipes, whole spices blend, zinc, zindagisikhati.